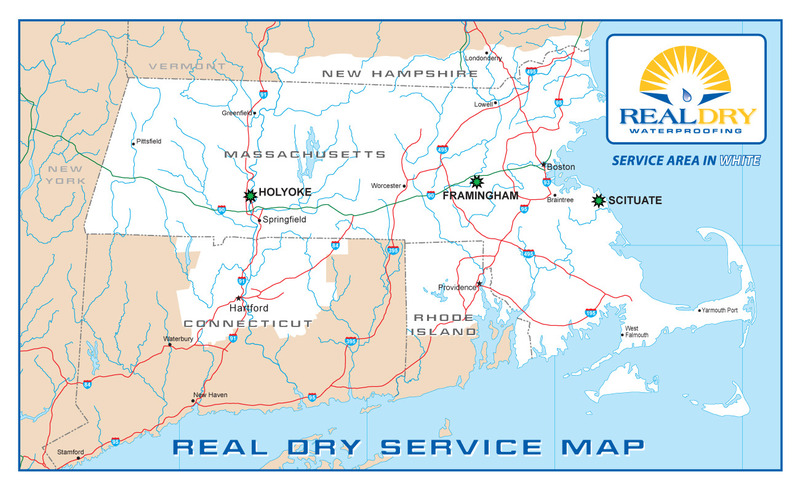 Real Dry operates throughout most of New England. As indicated on our service map, we currently have customers in four states – Massachusetts, northern Connecticut, Rhode Island, and southern New Hampshire. If you live in any of these areas, don't hesitate to give us a call to help solve your water, drainage, or basement needs. No matter if you have a basement leak, a wet basement, water seepage, need a sump pump installed or have cracks in your foundation, Real Dry Waterproofing will service and fix your problem and provide you with the repairs and peace of mind you need. Our offices are located in Holyoke and Scituate, Massachusetts. We also have a warehouse location in Framingham. This gives us easy access to western Mass., the South Shore, and the Boston area, as well as the rest of Massachusetts, northern Connecticut, Rhode Island, Cape Cod, and southern New Hampshire. Call us toll-free today at 1-855-DRY-TODAY (855-379-8632). Or you can reach us locally at (413) 536-5692 in western Massachusetts or (617) 470-0500 in the eastern part of the state. 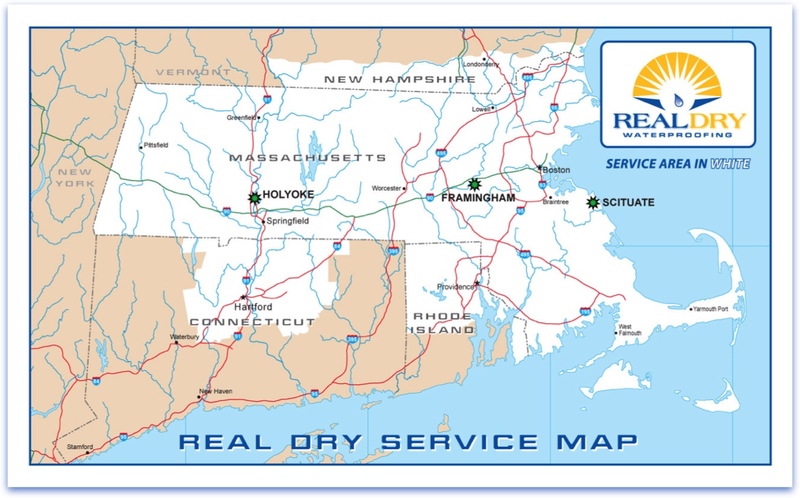 In MA, CT, RI, or NH, for a local waterproofing contractor you can trust, call Real Dry Waterproofing today! Click on the map image for a larger, more detailed view of our service area. Whether you're nearby in our hometown area of Holyoke, Massachusetts, on the South Shore near our Scituate location, out on Cape Cod, further west in the Berkshires, up on the North Shore, in northern Connecticut or Rhode Island, or even in southern New Hampshire, give us a call (toll-free at 1-855-DRY-TODAY) or reach out to us with our Contact Form and we'll come out and meet with you so we can determine the best way to solve your unique waterproofing issue. Fill out the form below, making sure to provide entries for all required items. For a more detailed form, or to send us a quick Email, click on the Contact Us item in the main menu. Real Dry does not share your email address or any of your personal information.